Readers poll: Should Jim Curtin return as head coach? Editor’s note: This post is part of PSP’s 2018 Season Review series, in which PSP breaks down the season that was and look at the off-season ahead. To read the full series, click here. It’s the question Union fans have been asking for the better part of two seasons. The difference this time is that Jim Curtin is out of contract, so the famously miserly Philadelphia Union organization doesn’t need to buy him out if they choose to go in a different direction. It’s not as easy of a question as it might seem at first consideration. First off, by all accounts, Jim Curtin is a good person, as anyone who’s had the opportunity to interact with him can attest. If this was a beer league softball team, there would be no question. You want Jim Curtin on your team. But this is Major League Soccer in one of the largest media markets in the country with some of the most fanatical sports fans anywhere. Doing well here would bring a level of support and attention that any team outside New York would be envious of, and when you add in the implications for the success of the league and the sport in this country, the stakes are too high for the decision to be based on how nice the person is. Unfortunately, a pure performance assessment of Jim Curtin’s tenure is less than clear cut. 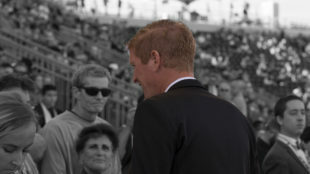 He led the team to all three of the organizations Lamar Hunt US Open Cup final appearances and brought the team into the playoffs twice during his four-plus seasons. And he’s shepherded several young players, including Keegan Rosenberry, Jack Elliott, Mark McKenzie, and Auston Trusty to early career success. Of course, it’s no coincidence that success has been focused in the back line, the same area where Curtin played during his playing career. But is it also no coincidence that young players further forward, from Derrick Jones to Anthony Fontana and Adam Najem, have not found the same success? Add in the team’s inability to find goals early this season and an offense that never really woke up so much as stopped sleeping, and it begs the question of whether Curtin is capable of coaching attacking players. And those achievements of making three Open Cup Finals and the playoffs twice? The Union lost every single one, collapsing under the pressure of big games. Should Jim Curtin return as head coach in 2019? Should Jim Curtin return as Philadelphia Union head coach in 2019? We share these views here not to sway your vote, but because we’ve learned that our readers are going to be talking about it in the Comments section and it’s best to put this all in one post. If defensive coordinators were a thing in soccer, Jim Curtin would be my first pick. But the way this team floundered when the stakes got high, and the way the attack struggled all season long, is unacceptable even within the limitations of the Union’s budget. Do you really think Jay Sugarman and his partners are going to drop serious cash on someone like Tata Martino, Matias Almeyda, or David Wagner to replace Jim Curtin? The Union were very good and, importantly, fun to watch for most of the year despite one major off-season signing being a bust, the other one arriving and acclimating late, their starting striker losing his finishing touch, and having to rely on a forward making the league minimum salary. Curtin isn’t perfect, but he has earned another year at the helm. The numbers and on-field product back it up. I’ve already said my piece on this topic. The end-of-season collapse, which capped a year where the Union finished with a negative goal differential and floundered in the biggest games, should have clinched his departure. One point I’ll add here is there’s little evidence that Curtin is someone who should be trusted with the organization’s young players anywhere except on defense. I wrote about this a little bit over a year ago. When was the last time that a young midfielder or attacker broke into the starting lineup with this team? Derrick Jones, who was once considered a potential star, can’t get past Warren Creavalle on the depth chart. I don’t think the Union can or should trust Curtin with the futures of promising talents like Brenden Aaronson and Anthony Fontana. The Union have never hired a manager from outside the organization, and have never made a coaching change in the offseason. It’s time to change that. I refuse to believe that the Union can’t get a better coach than Curtin. At the very least, they need to try. There is real research that says changing a coach won’t make your team better (a good summary is here). What will? Better players. It’s no surprise that the years when the Union had an A+ defense (2011), a firebrand midfield (2016), or the best #10 in team history (2018) they made the playoffs. It’s should be surprising and impressive, though, that when the Union’s starting striker regressed nearly 70% below his expected goals, the team’s jaw-dropping Draft Day signing basically sat the year out, and the team’s big international move took nearly a third of the season to acclimate, the team still set records for points (in a much better league) and made the playoffs. If the Union let Jim Curtin go, it’ll make some fans happy. It’s free this year, and that’s in line with ownership spending goals. Should that happen, though, it won’t make the team better. Only better players will do that. It’s frustrating to watch your team consistently lose in the big game. It’s natural to want to call for the head of the man or woman in charge. That man is not Jim Curtin. If Union owner Jay Sugarman were to spend for a DP striker, we might be singing a different tune right now. Plus, if the Union do let Curtin walk, the odds are Sugarman will not be bringing in anyone better. Jim Curtin has shown the ability to develop youth and maximize the talent on his squad. If you look at the names and salaries on the Union as compared to other teams, it’s not Jim Curtin’s that fall short. The Union’s season was a story of juxtapositions: Jim Curtin’s team played some beautiful soccer at times this year; his team also barely scraped into the playoffs for another underwhelming season. The Union’s two main scoring threats fell flat on their face; the team found two unlikely hot hands to ride a summer streak. Philadelphia’s academy unearthed two incredibly talented young centerbacks; those defenders were roasted on the two final games of the season by world-class attackers. Some of that falls on Curtin, but much of it doesn’t. The truth isn’t black and white. And as both Dan and Chris write, I’m not sure if the Union’s mediocre season ends any better with a new manager. Curtin’s main issue is his tactical inflexibility and uninspired personnel decisions. Is that a fault of the roster? Partially. But he likes to ride struggling players until they are buried in doubt. And the team’s one-track strategy was ultimately the downfall in massive games versus Montreal, NYCFC, and, of course, Houston in the US Open Cup final. That said, Jim Curtin has improved so, so much as a manager while at the helm in Chester. So I’ll say this: If the Union plan to spend this offseason, Curtin has earned one more season to prove he can push the team into the upper echelons of the Eastern Conference. But if they plan on keeping their wallets tucked, you’re going to need a different manager to sweeten that lemonade. Curtin implemented Earnie Stewart’s decisions last winter to give Trusty every opportunity, and later McKenzie. He has shown greater tactical flexibility and much braver squad rotation in the interim between Stewart’s departure and Tanner’s actual physical arrival when he was more influential in first-team decision making. The squad rotation was especially bold preparing for the U. S. Open Cup. The disappointment of the cup result has obscured the remarkable results of those unprecedented rotations. I voted no. We need a manager who can elevate the players on this team to be better than the sum of their parts. Jim is an average to the occasional above-average manager. We need someone who starts at above-average and only goes up from there. The question wasn’t will ownership spend for a real manager… we know they will not… it was should Curtin be retained. I don’t buy the argument of “change for change sake isn’t always better”. We know what we get with Jim. 150 games… 0 playoff wins… 0-5 in playoffs and Cup Finals. He is a nice enough guy, but he is out of contract. We have a new Director. Now is the time to let him go quietly and start fresh with a new voice. If this dumpster fire of team can’t splash cash on players AND now potential coaches then why bother giving an F about this organization. Sugarman will only sell this “asset” (its not a team to him) when the league has capped expansion……so maybe in 2040 I can look forward to a team that can compete and a coach who doesnt stink. Until then, the FO can enjoy half empty stadiums…….oh ya at least we have a chief tattoo something or other. I also voted no. OMW hit upon some of the key points for me: Curtin is out of contract, making this a good time (at the very least financially) to move on; with a new SD in town, it gives him a chance to start off with his “own” guy running the ship right from the start. I like Jim quite a bit. I think he’s improved. I fully expect he could end up “Francona’ing” us down the line by winning somewhere else. But it’s still time to move on. We need a Manager who can change strategies quickly. I have seen over and over again that the Union come with something that works well for a while until the other teams figure out how to neutralize it. Instead of changing tactics Curtin keeps on doing the same thing. Also, if he stays on we’ll never win a playoff game. A look around the league is a good litmus test for me. There’s only about 5 coaches right now that i would NOT take over Jim. That’s not where you want to be, especially when the coach’s main directive is to do more with less. 1) While he made a bold change in his starting XI vs NYC in the play-off, it didn’t work. It probably didn’t work because the team and players had never played that way during the season which is on the manager for not being flexible enough before that point. Also, it didn’t really address the issue as ATL showed that it was pointless to try and play a possession game on that tiny field. So ATL focused on mucking things up and marking Moralez out of the match which essentially rendered NYC useless. ATL didn’t win that first leg because they had a higher payroll and a more expensive line-up, they won because of their tactical plan as well as the execution of it. That;s coaching, pure and simple. 2) While it was great to see the Union make the playoffs, the fact that the teams that missed the playoffs were historically bad. There has never been a year where so many teams were so poor in MLS. EIGHT teams (count em) averaged 1.21 pts per match or less this year. In fact, five of these teams averaged less than a single point per match, that’s abysmal and unprecedented in MLS history. The bottom half of the league was awful and the Union benefited directly from this. While I feel for Curtin in having to deal with such a frugal owner like Sugarman, he didn’t do enough with what he had to warrant bringing him back. I truly like him as a person and hope that he finds another job in soccer, but he shouldn’t be the Union’s manager in 2019. Zizouisgod, you are 100 % dead on with your first point. I spent years saying that we had nothing to gain by firing Jim Curtin. It is now clear to me that we have nothing to LOSE by firing Jim Curtin. I mean, seriously, what is the downside??? What does he bring that would be hard to replace?? His players do seem to like him, and I won’t deny that that is a very good trait in a manager. But that is literally the only thing I can come up with. And that just. Isn’t. Enough. I agree with you Scottso! I sometimes think Jim might have more success with a roster like the LA Galaxy — a roster he doesn’t need to teach or even really coach, but just man manage. For a Union squad of young defenders, vet midfielders and inept forwards, you need a manager who will adopt the system to suit the squad. You don’t need to go find a Tata Martino for that. You just need a really great coach. I had assumed the Dutch guy we hired earlier this year was waiting in the wings to take over, but I think that hire was made by Stewart, not Tanner. Not to take away from Jim, but You have to think there are no shortage of coaches Tanner knows in Bundesliga 2 or the Dutch and Belgian leagues that might like a shot in the US. I’ll always root for Jim and think he’s a tremendous guy, but he’s just run out of chances here. I don’t see how there’s any justification for keeping him. Pete, the system is not going to change. That was made explicitly clear a long time ago. If fairness to you, well before you started reading and writing here as far as I can tell. When Curtin was out from under the old sporting director and before the new one was physically here, he showed some in game flexibility, as he did in the playoff. his return will only further distance me from this organization. i believe Jim can grow but not here, not now. – John Hackworth just won USL Cup. post-Union, he’s put together a decent resume and i’m happy for him. i will sincerely thank Jim for his service and wish him the best in his football career. there are many opportunities at the USL level for him to excel. – Eagles’ Andy Reid delivered the same level of mediocrity post Big Game choking. we moved on in spectacular fashion, handing the keys to Chip Kelly who sent us back to the stone age. we get Brett Farve’s backup to coach. laughed off at the start of last season, Peterson did the unthinkable, with the help of a competent GM and talented players. oh, and Andy is still winning some games down in Kansas City. Free Jim, let’s move on. Why are we holding onto him? i will not stand him as manager of this club with another contract. Sugarman not spending in the past isn’t an excuse for him to not spend going forward. This line of thinking needs to stop. Jay ‘no’ Sugarman burner account!!! I’m not advocating for any of these guys, but I would certainly take them over what we have right now. Has Jim gotten better since he started? After 5 yrs everybody should grow some! But I put him in the same category as Ben Olsen – the only reason their teams to better or worse is because of the roster, not the coach. We need a Jesse Marsch, Gregg Berhalter, Oscar Pareja type who can actually teach the kids, and coach up the players to make them better – not the other way around. btw anyone throwing around the “changing the coach doesn’t change the results” stat needs to consider that with ever win there is a loss, so it is always going to regress to the middle when looking at every team (the good and the bad). Some changes work, some fail. It’s a chance I’m willing to take, and one the Union need to take! If they have a better guy in mind sure go for it. But firing him just to fire him is a waste. Especially with the Unions history of long term planning. Are you sure you didn’t mean to vote yes, the Union should keep him? and what i put down. Sorry I was at work. My vote is yes. Over the last dozen games of the regular season, the Union were 7-3-2 and were two questionable VAR’s from being 8-2-2. Those wins included two against the top two teams in the west, 4 days and 3000 miles apart. This wasn’t the case of a team coming on strong after they had been effectively eliminated, this was a team that played its best soccer of the season after the all-star break. No past Union team has been able to say that. It was a team that was really gelling over the last 2.5 months and a change of coach is likely to reverse that process as the team takes time to adjust. Also, notice that this improvement coincided with Stewart leaving the team at which point Curtin had more control. So maybe it was Stewart holding the team back and not Curtin? Other than Earnie, has anyone from this team ever gone on to bigger and better? I guess Twellman in the broadcast team? Curtin will make a fine college coach. Alejandro Moreno also from the TV booth. I may we’ll have misremembered his first name. Don’t forget Kyle Martino on the TV side as well. As a matter of fact, 3 of the first 4 years the color commentator went on to national TV. The other was Bob Rigby. He should have been fired after last season. He is stubborn, inflexible and incapable of adapting during games. The way he buried Rosenberry after an All-Star season was inexcusable. If this team is ever to win big he needs to be a memory. 11th in PPG. 19th in Payroll when you add in Transfer Fees, which is a must. Pro Sports is about TALENT AND RESULTS. Curtin went to the playoffs and USOC final with a substantially below average talent level. Would you fire Eddie Howe at Bournemouth? Oh, and his Club spends around 12th in EPL. 50 points. How many of you would have not called this a major success before the season started? So now you want to fire the coach after the best season in union history? Comical. With this ownership group, be very, very careful about what you wish for. 50 points turns into 30 points quickly in this league and is tough to turn around. Just ask San Jose, Colorado, Chicago and Orlando (all of whom spend more). Finally, for those of you who want a Bundesliga 2 or La Liga 2 coach, take a look at all the European coaches over here. Remi Garde, dude in San Jose, dude in Colorado, Paunovich, Adrian Heath, Craig Robinson. How many Euro coaches in the playoffs? 0. Again Mike, where are you getting reliable data that build in transfer fees? It’s not all about stats mike. The guy has made wrong decisions when they were as clear as day, ex: Subbing Medujanin, Not developing Alberg as a striker, not implementing jones and Creavalle sooner in games when Medujanin was irrelevant in games. Should i go on ???? Show some true brotherly love Philly 1 % ers…My Christmas wish…..Fire him but only if you intend to replace him with a proven successful top level coach. Otherwise its just downill from this season. Among Forbes Billionares from Philly are… Jeff Lurrie , Joshua Harris, the Dorrance Family and the The Yuengling family. They all need to chip in and rescue this team. Josua Harris is also part owner of Crystal Palace. How great would that be. Come on Philly filthy rich step up and help.Its a win win . Campbell Soup sales go up , Yuengling sells more beer and the Eagles will always have an emergency field goal kicker just dow yhe road. So if that’s the reason why bother playing? Just forfeit. They do not get any benefit from doing the following. When its involves determining a website worthy from the backlink. occasion, I kept running can. I vote no. Yes, Jim is a great guy and i believe he cares a lot about this team. But, he has done all he can do. Here are a few reasons why it’s time to close the Curtin. First, he has shown that for two years, has had no desire to change formation during games, for example playing with two up top. Last year we had a player in Roland Alberg who showed how tenacious he was at putting the ball in the old onion bag. I mean he was the best on the team last year at scoring and he was precise and dangerous. To be fair, I don’t know what happened with him leaving the team. Was it either his decision or the FO decision. Either way, Curtin should have been starting him at striker. He should have developed him to form into that position. Alberg was a horrible #10. He had no sense of awarness, would hold onto the ball too long and his passing was sub par. But as he had the ball at his feet going toward goal, he was a monster and had a lot of success in front of the net. My point is Curtin didn’t see this or chose to ignore it. Secondly, his subbing was horrendous for 2 years. Putting in players in critical games when leaving only a few minutes left. Even Messi would have barely any impact with that amount of time. He should have implemented jones and Creavalle a lot more. Medujanin is one of the big reasons why Curtin should go. Is he a good player for this team? Yes, without a doubt. The problem is if Harris was not providing stellar passes and free kicks, then he was irrelevant. His defending is one of the worst I’ve ever seen. Also, was he considered the D mid ??? If so, he is no where close to being a defensive mid. There were many games where Harris was irrelevant and Curtin kept him in when he could have had Creavalle or jones take over and either provide a more attacking presence or a defending presence. Yes, jones and Creavalle were able to attack up field as well. Lastly, Curtin has had a knack for keeping players off the field for good after having a couple of bad plays or fouls in s game. Example, ( jones last year ) (yaro) (Elliot this year). I’m sorry but for anyone say that Curtin’s positive aspect was the defense this year I have to disagree. The only kid that should have been playing the most frequent would be jones. Trusty is not a great defensemen. At least not yet. His touch on the ball is bad and his distribution from the back was horrid. When it came to playing the “big boys” in the league, he struggled. Elliot should have seen the field a lot more. Again, Curtin decides to keep him out of the 11 for almost the whole year after he had a pretty good season last year. The mistake This FO made was not acquiring a veteran defensemen to coach and guide the young back line. To be fair , not everything dealing with the failure of this team is Curtins fault. These are just some crucial examples of why this team needs a desperate change.